Measures brought in to help protect sites of biodiversity importance are consistent with States-agreed objectives, according to the Environment & Infrastructure president. Suspected benefit fraud totalling nearly £1.5 million has been investigated by Jersey’s Social Security Department in the past three years. Staying dry with patchy cloud and long clear periods over most throughout Monday evening and overnight. A moderate southwesterly breeze. Minimum temperature: 13 to 17C (55 to 63F). Another dry and fine day is expected on Tuesday. Some lengthy periods of sunshine likely with just patchy cloud. A moderate southwesterly breeze. Maximum temperature: 17 to 21C (63 to 70F). 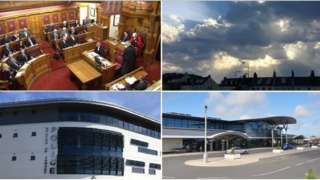 Children accused of crime in Jersey are now held at a secure home instead of prison, according to the island's childcare services. A report found in the past they were often held in places the Jersey Care Commission considered to be unsuitable. The commission worked with The Office for Standards in Education, Children’s Services and Skills (Ofsted), to inspect children's social work services in the island. Susan Devlin, director of children's services, said a review had changed the old system, and the children's "placement panel" now made the decision over where they should go. She said it was "really important" young people were kept at the secure unit for children at Greenfields instead of La Moye prison, or police cells. "We shouldn't have children in adult jails," she said, adding: "It's a very serious consideration to remove a child's liberty, we need to make sure a threshold has been crossed and that it's a very high threshold." Jersey landlords will have to meet new minimum standards when renting their properties under new laws being debated in Jersey on Tuesday. The new rental accommodation law is something other countries have had for more than a century, according to the island's environment minister. Deputy John Young, said: “This important law is not a panacea to solve all of Jersey’s housing problems. The law was approved in principle by the previous States Assembly and was given Royal Assent in March, but the general election in May and the summer recess meant it couldn't come back to the States for final approval until Tuesday 11 September. If approved it will come into force from 1 October 2018. Using Longue Hougue Reservoir as a future site for inert waste would leave the Island at an "unacceptable risk of drought", according to Guernsey Water. Longue Hougue is the largest reservoir in the island, contributing more than a quarter of Guernsey's total water storage according to the only water company in the island. It has been suggested as a site for the storage of inert waste as part of the island's inert waste strategy. More than 100,000 tonnes of the waste is generated by local construction and demolition activity and does not decompose, but can be re-used in construction and landfill. Guernsey Water says it is currently needed to ensure a supply of water for the island and would need time to consider alternative reservoir sites if Longue Hougue were to be used for storing waste. Cash and raffle tickets raising money for a new ambulance were stolen from a cafe in Guernsey, according to St John's Ambulance. Chief Officer Ali Marquis said about 50 ticket stubs and £100 were taken from the Saumarez Park Cafe on Saturday night. "I am disgusted that anyone would take charity money in a theft like this," she said. The tickets were being sold to help raise funds for the new emergency ambulance appeal and the stubs were due to be collected before a charity concert on 22 September. Ms Marquis has offered replacement numbers to anyone who bought tickets from the cafe, before the draw takes place. A man was taken to hospital after falling 32ft (10m) from Guernsey's harbour in St Peter Port. He had to be immobilised before being taken to A&E as medical staff thought he had a back injury. St John Ambulance crews said they were called at about 23:00 on Saturday to the Albert Pier, Victoria Marina. Police and fire crews also attended. The Guernsey and Alderney Youth Commission hopes to get young people outdoors more as part of a series of new programmes. The commission, which is an independent charity, worked with young people to establish what they wanted. They have launched five new programmes covering creative, active, outdoors, skilled and off island. Jersey's outgoing Roman Catholic Dean says retirement will allow him to prepare for the next chapter of his life - and his death. Monsignor Nicholas France leaves Jersey on Monday to live in Southampton after 19 years in the role. His final mass services was held at Fort Regent last week. He said his next step will - eventually - be to prepare "to make a good death". A barbecue fire started after a gas canister leaked, fire crews have said. It happened at a house in St Clement on Saturday at about 16:20 and no injuries were reported. A fire service spokesman said: "The owner had done the correct thing and checked the connections on the pipework of the barbecue before use. "However, the regulator on the bottle had not been sufficiently tightened using a spanner and was loose enough to allow gas to escape." Suspected benefit fraud totalling nearly £1.5m has been investigated by Jersey’s Social Security Department in the past three years. Jersey's adoption authorities have changed the way they train potential new foster carers, to try to attract more people to look after children in the island. A report from the Jersey Care Commission said the way children are looked after needed to be improved. It also said there is a shortage of people willing to look after young people in their island home. Authorities say 23 of the 93 Jersey children in care are with families in the UK. Children's services director Susan Devlin says they needed to make training more accessible. We've changed how we deliver training, it used to always be during the week on an evening for six weeks. We're now looking at a three-day course over a weekend to try and cater for people who would struggle to do it during the evening." Vandals spray painted a white van with two sets of initials in Guernsey, police have said. The Citroen was parked in the Valnord Estate, St Peter Port, and had the initials W.B and O.W sprayed onto its panels in black paint. It happened some time between 13:30 on Saturday and 08:00 on Sunday. Not enough help is available in Jersey for the friends and families of those who take their own life, a mental health charity has said. James Le Feuvre from Mind Jersey says he wants to introduce a volunteer support worker role for those bereaved by suicide. In the run up to World Suicide Prevention Day the charity has been working with health officials in Jersey to develop a "peer support programme" to do this alongside professional help. According to states reports the suicide rate in Jersey was 10 per 100,000 in 2012-14 for persons aged 10 and over. Jersey Reds chairman Mark Morgan says the team need to be "more clinical" after Saturday's 26-22 loss away at Bedford. The result leaves the Reds second-bottom of the Championship table after two games of the new season. While some decisions on Saturday did not go their way, Morgan thinks Jersey squandered too many opportunities. Somebody had to take responsibility at that point, get their heads down and finish the opportunity off. It's a bit like the old football adage of trying to walk the ball into the net, well no, let's get our heads down and score some tries." Hundreds of people turned out to show their support for Channel Islands Pride in Guernsey this weekend. The event supports the LGBTQ community and promotes equality for everyone regardless of gender or sexual orientation. Samantha Le Noury who joined in the celebrations says it gives people confidence to be whoever they want to be. This island is moving forwards, we are not going to stand by and let people be bullied or let people be harassed for who they want to be. So this is all of us standing up and saying 'we're here, we're for it, we don't care what you think - so try and stop us'." A drunken homeless man who shouted racist abuse at the proprietor of an Indian restaurant is going to have to keep returning to court to prove he can stay out of trouble.